55 year old Reyes Pedro Cuervo is reportedly a preacher at Iglesia de Goodrich (a local bilingual church in Goodrich). Sheriff's Office Seeking Possible Information on Alleged Child Molester, GOODRICH, July 22, 2014 - On January 23, 2014 The Polk County Sheriff’s Office received a report in reference to sexual misconduct. The female making the report is now an adult. The female stated when she was a child she was sexually assaulted by Reyes Pedro Cuervo, 55, of Goodrich. The female stated when this happened she was a child and did not realize it was wrong. The case was presented to Grand Jury and an indictment was issued for Indecency with a child by sexual contact. 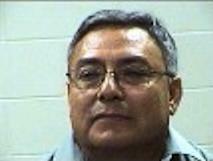 On July 8, 2014 Cuervo Pedro Reyes (hispanic male, D.O.B. 10-23-1958) was arrested and placed on a $75,000.00 dollar bond. During the course of the investigation Detectives felt there could be other victims. If you know of someone who has been victimized by this man or if you are a victim please contact the Polk County Sheriff’s Office.